Forget about 2 frame machines with rock bottom pricing! 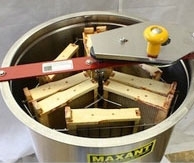 Are you into beekeeping seriously? Why waste your money on a low priced machine unless you think your enthusiasm is a one year deal! 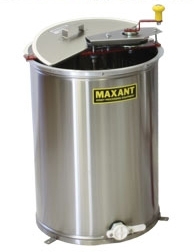 The Maxant hand extractor is built to last a lifetime. These tanks are constructed from 20 gauge #4 polished stainless steel, with a conical bottom TIG welded for maximum draining. These machines can be converted to power when you are ready to get serious. This machine is 18.5" in diameter, and 24.5" in height.